After the quilting and embroidered things I made for a girl starting over, an embroidered quilt for my best friends b-day and a large baby package for a special couples 1st baby, I haven't had a lot of time for xmas things this year. However, I did get a few things finished and this is what i did. The first two I made for my mom who is in assisted living. 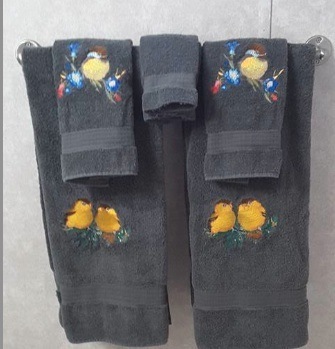 The towel set was suppose to be a housewarming gift for a cousin but I think it ended up being more of a xmas gift than a housewarming gift. And the snowballs were for a wonderful extended family that are already having a blast with them! Thanks for looking and a Very Merry Christmas to All and wishing you all the best for the New Year!!! Quite a wonderful collection of gifts! You've been busy! Hard for me to pick a favorite! I love your stipple quilting looks great, u did such a nice job on your snowmen too. Oh wow, you have done a really great job on all of these. The quilted pointsettia is amazing. Thank you. The recipients loved them. 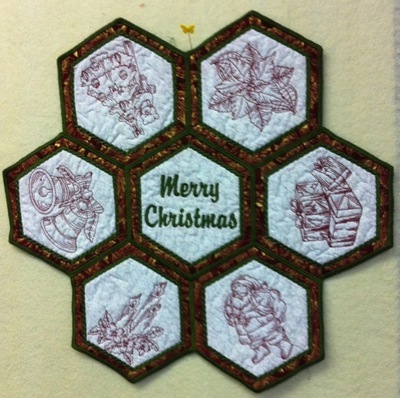 Yes, I did the quilting. Now that we are back in Canada again, I will be doing all the quilting - unless I am unable to do it due to health issues. Wow - these are all beautiful!! Great work on all projects, well done. Sandra. Thank you everyone for your kind comments! Merry Christmas and Happy New Year! Here's hoping that 2016 brings peace, health and happiness to all! Hope Santa is good to each and everyone of you! Ho! Ho! Ho! Busy lady, the snowballs made me smile. The family that got the snowballs were thrilled! Thx. Both were appreciated by the recipients and that makes it all worth while! All of your design are beautiful. Your table runner is stunning. I admire those that can make that pattern. Great work. Thank you. The table runner is actually a very easy pattern to make. Thanks and they did love them! All zeros girls please water the flowers ok?? Very lovely gifts. Thank you for sharing. 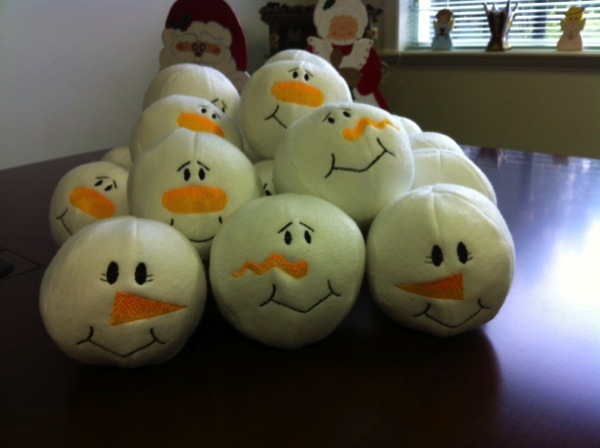 I like all the different faces you put on the snowballs! The table mat is fabulous! 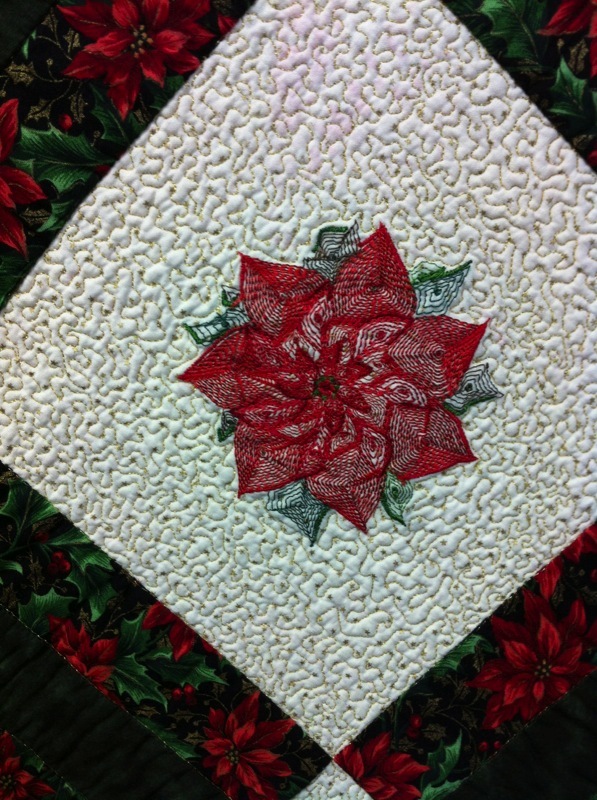 Did you do the stippling before you stitched the poinsettia on? Thanks. I did the stippling after I stitched out the poinsettia. Wow, lots of great projects!!! Very very nice work! You have been busy! Everyone is going to be very happy! You sure have been busy. The lucky recipients. They are outstanding. Well done, they are beautiful ! Hugs. your gifts are very nice and hopefully will be appreciated. Because we don't have snow where I live in South Australia, I am assuming you have an "indoor" game of SnowBall throwing. How does it work? Are there teams and if you get 'hit', you're out? Anyway, they look fabulous. Merry Christmas to you.